Ask about great discounts for multi week reservations!!!!! Litchfield County - Highland Lake three-bedroom lakefront cottage with private dock. Located on the east side of lake -enjoy beautiful sunsets right on your private dock. Beautiful, clean lake 3.5 miles long. Trophy trout lake. Great bass fishing lake. Areas of lake are 85 feet deep. The water is so clean you can see bottom in 30 feet of water. Enjoy boating, wind surfing and canoeing in beautiful third bay or any of the five quiet coves. Cottage is fully furnished with an all-glass great room overlooking the lake. Enjoy a beautiful view of the Berkshire Mountains, magnificent sunsets on your private back yard. Best Sunsets,Clean, Recreational & Private. : Magnificent Lake with a very private waterfront lake house. get away to a new lease on life less than 2 hours from NYC. Best sunset over the Berkshires. Best location for Paddle Boarding in quiet cove. In event you have to cancel- a full refund will be given if the property is re-rented. It is in the best location of the lake with beautiful sunsets on your very private dock. Views from the great room are spectacular overlooking the lake. There is a vacant lot next door to you to add to the privacy. You are 240 feet off the road which is great for safety and serenity. Stationary dock with Brazilian Hardwood. Dock does not bob up and down from occasional boat waves- safe and great for that book you planned on finishing ages ago. Open kitchen and great room overlooking the lake. Extremely private for a lake house. Private deck overlooking dock with gas grill. Three miles to fantastic antique shops, restaurants & movies go carts, mini golf and college campus. . Plenty of small towns and villages close by to go antiquing and museum hopping. Great day trips to Mark Twain House, Ct Science Center; Tanglewood, Norman Rockwell Museum; Antiquing in Millerton. Third Bay East side - best part of Highland Lake. Stunning View from Great Room and your private dock. Clean spring fed lake for best swimming. Highland Lake is 444 acres approximately 3.5 miles long-7 miles around & 87 feet deep &spring feed which attributes to it's crystal clear water. Trophy Trout Lake-must be clean! Gorgeous view from your great room and 2.5 miles of lake from your private dock. Foothills of the Berkshires with beautiful view from your private dock; Deck and Great Room.. Breathtaking views in the backround of Beautiful Highland Lake. Beautiful full waterfront View from Kitchen/Great Room and Dinning Area-Wall to wall glass- most beautiful view. Cool comfortable wake up and afternoon sun till Golden Sunset on your private dock. Steps to the clean gorgeous refreshing water off your private stationary dock made of IPE- Brazilian Hard Wood. Land Line as cell service might be spotty. All linens provided except personal ones- sheets and pillow cases and Bath Towels for showering. All hand towels supplied. If flying in, we can make arrangements with a supplier. Off street parking for 8 cars. All hand towels for kitchen and bath. Personal bath & beach towels we ask clients to bring their own. 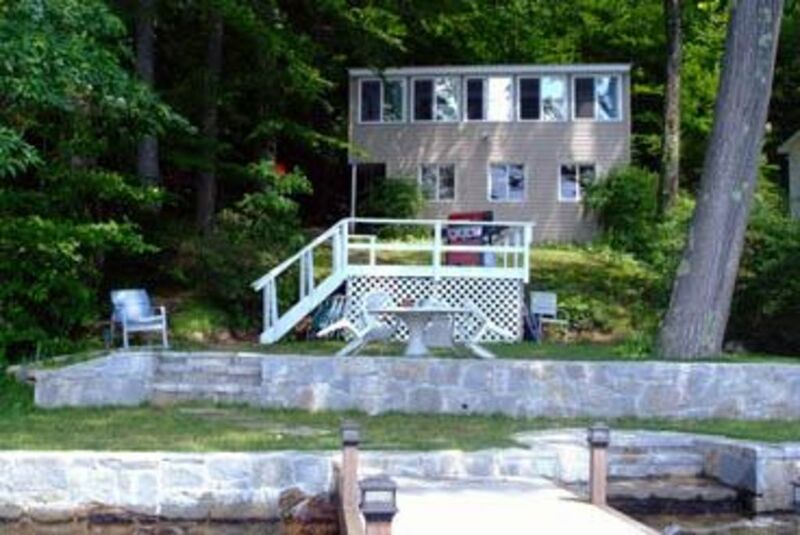 Great room with beautiful view of lake; your private deck and dock and Berkshire mountains. Sun sets are amazing- right over the mountains shining on your guests on private dock. Huge Great Room overlooking the lake with table giving view of the Berkshire Mountains. Private deck and dock with Brazilian IPE hardwood - absolutely gorgeous and safe as it is stationary-- not affected by waves of boats. Greenwoods is located ten minutes away -- a private course that does allow public tee times. 3 full beds- sleeps 6 comfortably. Canoe with paddles. .
Had a wonderful week, great weather & the lake was a welcome relief on hot days. Dock and waterfront area very well maintained and spacious. We enjoyed the great views from the cozy cottage as well, look forward to returning to Highland Lake. Best Vacation in the cleanest property - great views and awesome sunsets. The cleanest property that I ever rented. What a relief to walk in and see it spotless with such detail to every part of this property. Great location- very private with beautiful view of the lake and gorgeous sunsets. The stationary dock was great to lounge around and read without it going up and down with every wave. Can't wait to go back. We had a lot of fun here and appreciated Rick’s willingness to be available if necessary. The views were great and the stone wall areas by the water beautiful. Although the weather did not cooperate the week we stayed, we were all able to enjoy ourselves. The location is gorgeous and the lake is so clean. We had a great time at the lake house! House is cozy and the the location on the lake is amazing! Spent most of our time enjoying all of the activities outside! Thank you for taking your valuable time to write a review that will help others decide if this is the best property for their vacation. We live four doors away for 28 years now and love the location on the lake-gorgeous sunsets right on your private stationary dock. Our cove offers a beautiful view of the lake and Berkshire Mountains and is not a busy part of the lake. Thank you again for writing a review. A True Find You Just Have to Experience!! What an amazing week we spent at this spotless cottage. It was a pure delight! Everything, and I mean everything was exactly as Rick described. The decor and cleanliness made it a welcoming place to reside and honestly we hated to leave. The beds were so comfortable that it was easy to sleep in and relax. Yet when we felt like being active there was plenty to do. The lake itself is incredible. The view was spectacular and I can't even begin to describe the sunsets. The cottage had plenty of space to entertain both inside and out. Plenty of room for company to stay when friends and family dropped in. This cottage is so well maintained both inside and outside that it is impressive. Rick, you have thought of all the little things that make this cottage a beautiful home. Thanks for sharing your piece of heaven. I can't wait to return. I definitely recommend this property to rent. I can guarantee that you won't be sorry. Thank you so much for taking your valuable time to acknowledge the amenities and other features of the cottage. We love the cottage and really enjoy it when guests have a great time. Thank you again for your input as it will assist other travelers decide if this is the right property to spend their vacation. Close to Lenox, Stockbridge, Tanglewood. Great antique shops and restaurants all the way to Millerton, N.Y. Enjoy Berkshire attractions-Hancock Shaker Village, The Berkshire Museum, Jimminy Peak, Clark Art Institute, Williams College Museum of Art, The Colonial Theatre, Normal Rockwell Museum, Train rides from Lenox to Stockbridge, Shakespeare & Company. The lake is so beautiful, most people never leave! Golf: Awesome Golf Course- Greenwoods - formerly private club but you are able to pay greens fees and golf when staying at the cottage. Ski: Ski Sundown New Hartford- 20 minutes and Butternut Basin Great Barrington, MA 50 minutes drive. Antique Shopping Downtown Winsted 10 minutes all the way to Millerton NY - one hour drive. Monthly Rates during the Fall and winter months are available at a discount. Please contact for rates. In case of cancellation we will refund all payments if property rerented.